Using the Moon for trading. Really? What is the biggest challenge for an investor? Why bubbles are usually a good thing. Quantitative squeezing – what you need to know. Putting the QE toothpaste back in the tube. This is not an official technical formation, but perhaps it should be. Brown leaves happen when after a significant rise in the market you get a top followed by two lower highs with subsequently lower lows in between. So, three clearly distinct legs to the downside, each time falling lower and trying (but failing) to recover the losses on rebound attempts. The third leg down should partially overlap the first leg down and there should be relatively few good green candles within the pattern, as you see in above example. This pattern usually forms within one or two months on a daily chart. This formation is not a good omen and often leads to a much bigger correction. 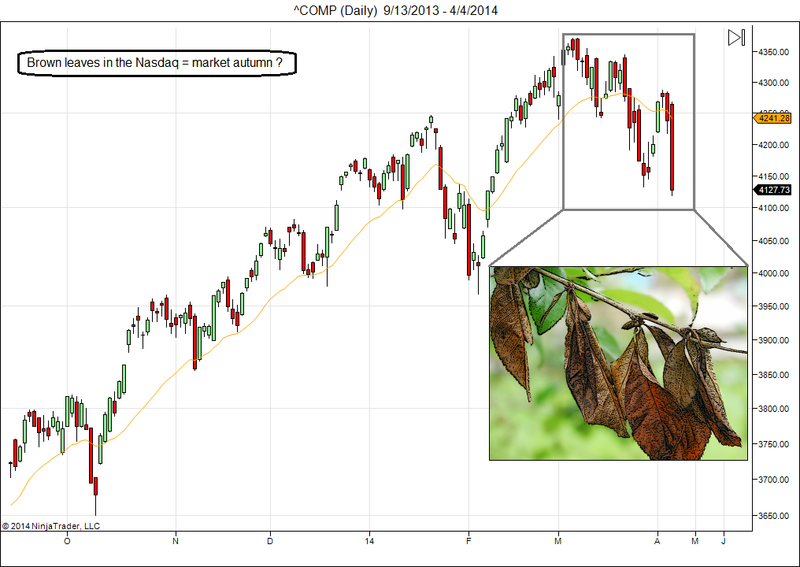 The warning sign stays in effect until the market takes out the high that started the brown leaves formation, or until a significant new low is made below the bottom of “leaf 3”. Bearish divergences in my technical indicators are once again very prominent in this chart, and the S&P is starting to look increasingly tired as it keeps struggling to reach the upper boundary of its long term trend channels. We remain in a lunar red period for 10 more days, so more downside action is likely. The 1800 level is the first line of support, followed by 1750. The scenario for a test of the 1600-1700 area this summer remains firmly on the table. NASDAQ, Russell 2000 Signaling Buying Opportunity Ahead? 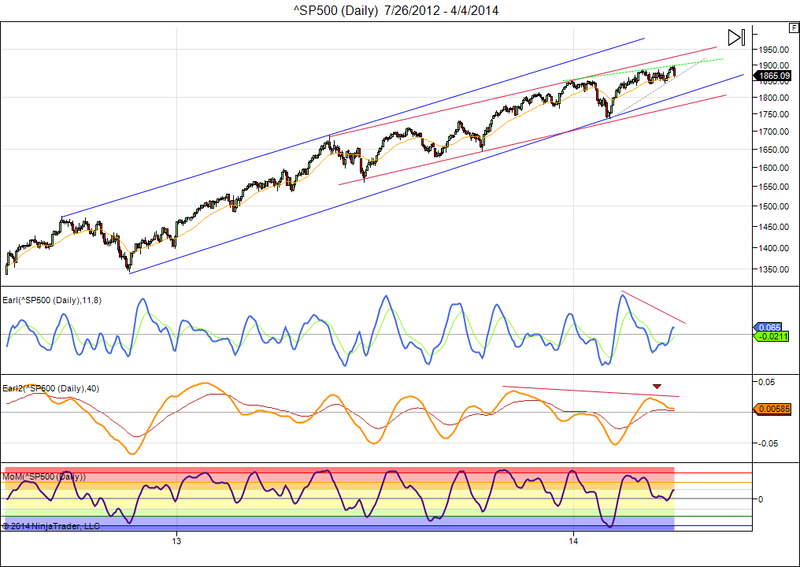 This entry was posted on April 7, 2014 at 11:42 am	and is filed under Financial Astrology, Market Commentary. Tagged: lunar cycles, Nasdaq, Technical analysis. You can follow any responses to this entry through the RSS 2.0 feed. You can leave a response, or trackback from your own site.